Need a little passion in your cooking? 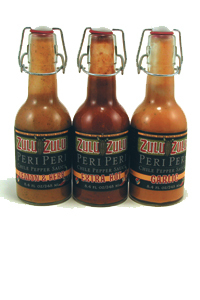 These three new Zulu Zulu chile pepper sauces will sizzle up any kitchen or grill. Made from the Peri Peri pepper found in South Africa, these sauces will add flavor to your fish, chicken or meat dishes, not to mention they come in a cool flip top bottle. Try one or all three today! The hot Peri Peri had a great flavor, but not much heat. This is pretty good. It could be hotter, but I love the flavor. Tapatio Hot Sauce- 5 Oz.